Second only to the Daleks, no alien menace had as prolific of an impact on early Doctor Who as the Cybermen, the horrific and emotionless results of the Mondasian peoples’ desperate attempts to survive that then became dedicated to converting others to ensure the spread and legacy of their cybernetic race. Yet after featuring in four full adventures during the Second Doctor era, this metaphor for humanity’s advances was notably absent from the Third Doctor’s adventures aside from a brief visual cameo on the miniscope screen in ‘Carnival of Monsters’ and much later an onlooking scene as a Raston Warrior Robot massacred a group in ‘The Five Doctors.’ However, The Companion Chronicles, just as much as allowing further insight into certain characters and decisions is also perfect for rectifying notable situational gaps in the Doctor’s televised outings, and ‘The Blue Tooth’ by Nigel Fairs finally sees these two forces cross paths as Liz Shaw’s friend Jean goes missing. In many ways, Liz Shaw is one of the most unique companions in all of Doctor Who, having never traveled in the TARDIS and maintaining her interactions with the Doctor and UNIT solely as her day job and distinctly separate from her life at home. In fact, with only a passing comment that she had left UNIT to go back to Cambridge following her last appearance in ‘Inferno,’ Liz has always retained a sense of lingering mystery despite an incredibly impactful presence from Caroline John that redefined the traditional companion role during her four stories, and it’s through the events portrayed here that the groundwork is placed for that eventual departure. Indeed, though the material itself isn’t necessarily revolutionary, it’s incredibly rewarding to discover how Liz balanced her academic and social life at Cambridge alongside her friend who likewise comes to life immeasurably well due to pinpoint and emotive description. Fortunately, the descriptive power is just as evident when handling the threat of the Cybermen as the horror of conversion is spotlighted with Jean all too sadly a victim. Although the Cybermen are absolutely one of the most dangerous forces in the universe, they are wholly more effective when their desperation for survival and propagation features, and the eerie thought of a dentist office being used to instill affected fillings that aid in this purpose is well-realised and ambitious in an understated and grounded manner. This perfectly complements the earlier tension of Liz exploring her friend’s home and the incredibly gruesome image of a sliced man being found to be made of metal with cybermats bursting forth. The individuality shown here as new ways to convert must be found is simple yet brilliant in its execution, and rarely has this cybernetic race been portrayed so effectively, a fact that is attributed directly to the quality of writing and the superb narration laced with emotions that Caroline John delivers both as she confronts the circumstances leading up to Jean’s death as well as her own experiences as she herself becomes a victim of the living metal and cybermat menace. While it’s undeniable that John doesn’t attempt to capture the mannerisms of Jon Pertwee and Nicholas Courtney, the interactions between the characters are excellent and John delivers them in an incredibly endearing manner that captures the close-knit relationship this trio shared. 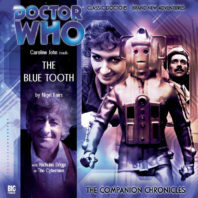 Aided as well by Nicholas Briggs’s iconic Cyberman voice and an effective score, ‘The Blue Tooth’ is one of the finest Cyberman tales available and manages to capture the nuances of every being involved while finally providing the Third Doctor with an opportunity sadly missed during his televised run and Liz some well-deserved detailing.